When is Serre Chevalier going to get fresh snow? This is the Snow Forecast and Weather Outlook for Serre Chevalier, France from 19 April. For current snow depths and skiing conditions, see our Current Snow Report for Serre Chevalier. When will it snow in Serre Chevalier? The next notable snow forecast for Serre Chevalier is 3cm1in, expected on 23 April, with around 22cm9in forecast over the next 7 days. There is some snow currently indicated by the long-range (7 days+) forecast; but too far ahead to be relied upon. Serre Chevalier is reporting “Spring Snow” with very light new snow forecast in the next 48 hours. Snow Line ranging from 2,178m7,146ft to 1,751m5,745ft, with rain below. Snow Line ranging from 2,161m7,090ft to 1,890m6,201ft, with rain below. Patchy moderate snow at altitude. Snow Line ranging from 2,486m8,156ft to 1,942m6,371ft, with rain below. Snow Line ranging from 2,482m8,143ft to 2,344m7,690ft, with rain below. Snow Line ranging from 2,409m7,904ft to 2,257m7,405ft, with rain below. Snow Line ranging from 1,552m5,092ft to resort level. Snow Line ranging from 1,705m5,594ft to resort level. Snow Line ranging from 2,167m7,110ft to 1,244m4,081ft, with rain below. Snow Line ranging from 2,167m7,110ft to 1,398m4,587ft, with rain below. Snow Line ranging from 2,167m7,110ft to resort level. Snow Line ranging from 2,013m6,604ft to 1,244m4,081ft, with rain below. This Snow Forecast for Serre Chevalier, France gives the predicted Snowfall and Freezing Levels for the next week. The forecast snowfall depths given are the likely average accumulations for the Lower and Upper slopes. The actual snow depth in Serre Chevalier, on any given piste or itinerary, may be dramatically different, particularly if the snowfall is accompanied by high winds and/or varying air temperatures. 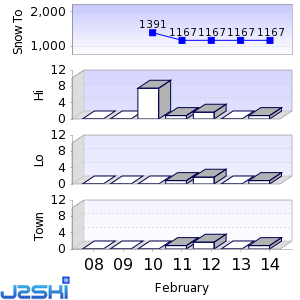 Serre Chevalier Snow Forecast built at 08:12, next update at 14:00. Want to Know when it Snows in Serre Chevalier? Create your own J2Ski Account to get Free Snow Reports and Forecast, with Powder Alerts, for Serre Chevalier. Click above to get Snow Reports by e-Mail for Serre Chevalier. By doing so, you agree to Our Rules. 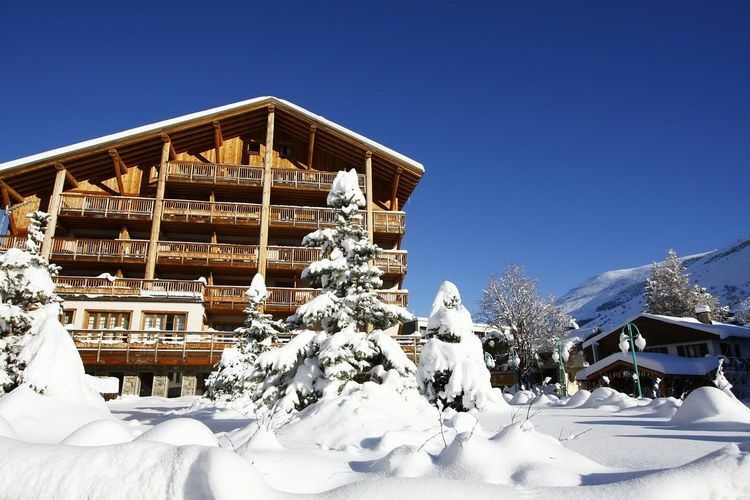 For more information about this French Ski Resort, See Also Skiing and Snowboarding in Serre Chevalier . Snow and Weather Forecasts for other Ski Areas within Grande Galaxie. Snow and Weather Forecasts for Villages within Serre Chevalier. Snow and Weather Forecasts for other popular Ski Areas near Serre Chevalier. Snow and Weather Forecasts for popular Ski Areas in France. Ski Hire Shops in Serre Chevalier, Briançon, Chantemerle, Monêtier les Bains and Villeneuve. Piste and Lift Stats for Serre Chevalier, France. For current snow conditions, see our Serre Chevalier Snow Report. Note :- The Snow Forecast for Serre Chevalier, on J2Ski, is updated frequently and subject to significant change; snow depths and skiing conditions vary rapidly, as can all Mountain Weather Forecasts. Warning :- Snow Sports are Dangerous! Skiing, snowboarding and all winter sports involve risk of serious injury or death. You MUST confirm all information, especially snow and weather conditions, in Serre Chevalier before you ski or board. You participate at your own risk.